1) Unemployment reimbursement (arbetslöshetsersättningen) – up to 80% of your income with a maximum limit of 18 700 SEK per month (if you are a member of AEA and have been a member for at least 12 months). The unemployment reimbursement is represented as orange and blue in the bar chart. You are entitled to 300 days of unemployment reimbursement. 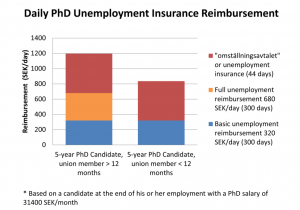 2) Unemployment insurance or “omställningsavtalet” (inkomstutfyllnaden) – You can receive up to 80% of you old salary if you are a PhD candidate employed by the state (scholarship PhD candidates are not employed by the state). The unemployment insurance pays the difference between 80% of your maximum salary and the 18 700 SEK maximum limit from the unemployment reimbursement. The unemployment insurance is represented in red in the bar chart. The new rules no longer consider PhD candidates permanent employees, which entitles PhD candidates to 44 days of unemployment insurance. After 44 days you will only receive the unemployment reimbursement (680 SEK per day or 320 SEK per day). The sources of income during unemployment are graphically illustrated in the bar chart below. If you have not been a member of a-kassan for at least 12-months you will receive a basic compensation (320 SEK/day) and “omställningsavtalet” reimburses the 80% of your salary as if you would have received 680 SEK/day. “Omställningsavtalet” does not cover the money lost between 680 and 320 SEK/Day. If you receive full reimbursement from a-kassan (680 SEK/day) the “omställningsavtal” will pay the remainder balance so you receive 80% of your previous salary. If you have been employed for 3 years you are entitled to 44 days unemployment insurance through “omställningsavtalet”. To receive unemployment insurance you must also receive unemployment reimbursement from a-kassan.